“Fantastic Art, Dada and Surrealism” was an exhibition which took place in the MoMA in 1936 and transformed the vision of the artists on regards modern art. Among them, we find Dorothea Tanning, a freelance illustrator who worked in New York. From there, she became familiar with the works by Max Ernst, one of the pioneers of the movement who, in 1942, visited Tanning in her studio. As today’s painting was untitled, he suggested its name, Birthday. A week later, they started a relationship; until they married in some kind of surrealist wedding á trois next to Man Ray. 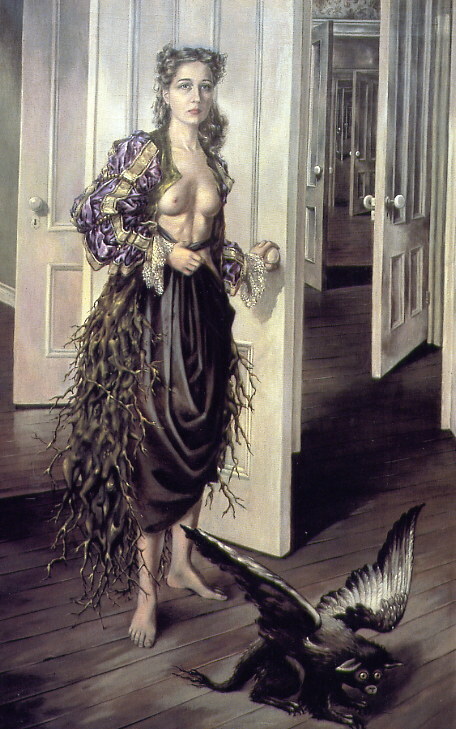 In Birthday, we see a self portrait of Tanning wearing a strange dress. The top of it has sleeves typical of the clothes the kings wore long time ago, leaving her breasts uncovered. Under the waist, Tanning wears some kind of black skirt with an accessory like roots on her back. The artist is opening a door which shows an infinite succession of doors half opened. At the lower right corner, we can see a furry creature representing a pet. Indeed, it is surrealistic. ~ by Álvaro Mazzino on April 1, 2011. This entry was posted on April 1, 2011 at 17:28 and is filed under Surrealism.You can follow any responses to this entry through the RSS 2.0 feed.You can leave a response, or trackback from your own site.